Delikon Heavy Series Over Braided Flexible Conduit and Heavy Sheath Flexible Conduit Fittings protect CNC EDM Machine Data and Power Cable and Fluid Line. 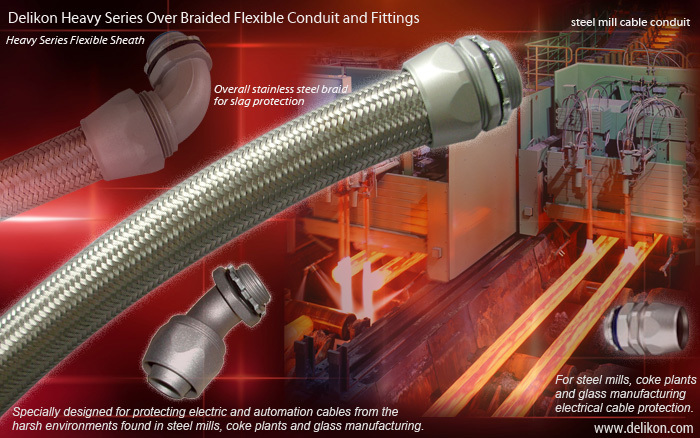 Delikon Over Braided Flexible Conduit and Fittings provide very reliable performance. 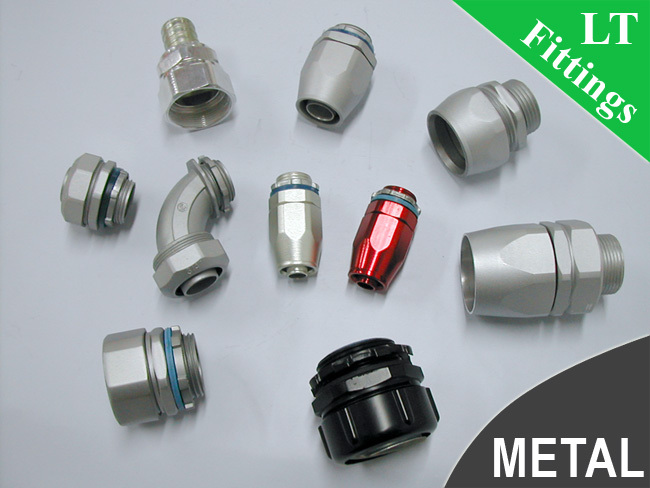 METRIC PG NPT ISO 228-1 THREAD liquid tight conduit connector,liquid tight conduit fittings,liquid tight CONDUIT fittings. 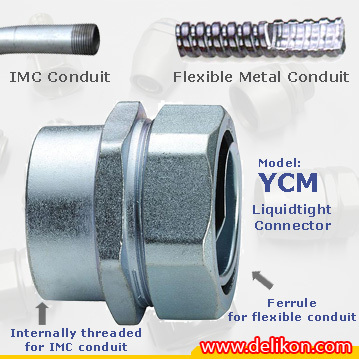 Delikon produces a whole range of conduit fittings for use with liquid tight conduit, flexible metal conduit and over braided flexible conduit. 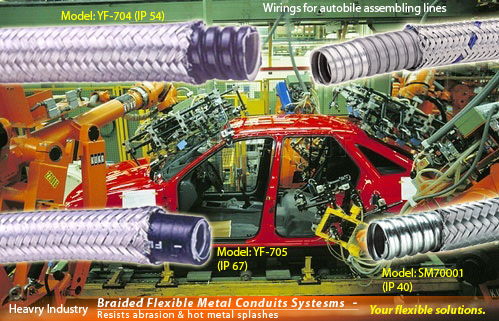 Over braided flexible metal conduit systems are ideal for use in high temperature industrial applications with sparks, weld slag or hot swarf. Over braided flexible metal conduit are also suitable for screening electromagnetic radiation. We offer an extensive range of lexible Conduit Systems for cable management (Liquidtight Flexible Conduit,Braided Flexible Conduit) and High Performance Hose for racing car. Perfect all-round FLEXIBLE protections for your demanding projects. Delikon has introduced a complete line of FLEXIBLE OVERBRAIDING CONDUIT SYSTEMS, providing one of the most comprehensive ranges available. Developed for use on machining and OEM applications, the protective overbraided steel conduits systems have extended their applications for chemical, engineering, offshore, rail, underground, tunnel and security applications, or wherever systems could be subjected to vandalism. The Screening overbraiding can afford a standard or high degree of EMI screening capability protecting the cables carried within the flexible system. The braided flexible steel conduits are most suitable for electromagnetic compatibility (EMC) or where electromagnetic interference EMI screening of conduit is required. Where abuse resistance is a consideration, the abrasion resistant stainless steel covered polyamide conduit system, Type PBF, offers low fire hazard properties of a non-metallic flexible system with stainless steel braiding. This makes it suitable for locations prone to vandalism, the use of overbraided flexible conduit affords additional protection to umbilicals on CCTV systems, particularly in remote locations. Overbraiding increases the security of installations in sensitive or high risk public areas, typical applications being underground, communications, public safety, security, lighting and CCTV installations. Delikon Screen Flexible Conduits Systems also offer cost-effective alternatives to individually screened cables within applications where cross talk has no adverse effect. Additionally, the user gains the mechanical advantage of a cable management system, which afford the means to easily add, substitute or replace cables in an existing cable run at any time. Delikon manufactures a range of petrochemical, high-specification electrical flexible conduit systems covering many specialist applications, for industries as diverse as healthcare, offshore, minging and food and drink. 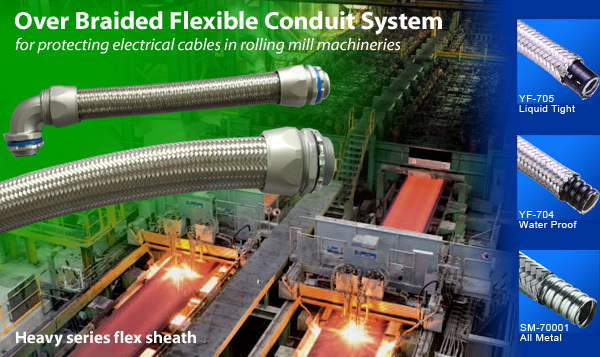 Flexible Conduits made by Delikon is specified for plant rooms, machinery and machine tools, security systems, marine and offshore installations, railways, oil and gas installations, hospitals and more. Heavy series flex sheath - Over Braided Flexible Conduit System for protection of industrial electrical cables against water, oil, grease, solvents, and the outer stainless steel wires braiding provides protection against hot metal sparks and slag. Delikon Liquid tight metal conduit,Clean, smooth metal interior for easy wire-pulling and requires no special tools for cutting or bending.Delikon liquid tight conduit system provides the safest possible protection from moisture, oil, chemicals, acid, alkaline and the ozone. Tough Ultrabond, anchored polyvinyl chloride, extruded cover seals the spirally-wound, square-locked flexible galvanized steel core. Eliminates maintenance and downtime due to wiring failure. 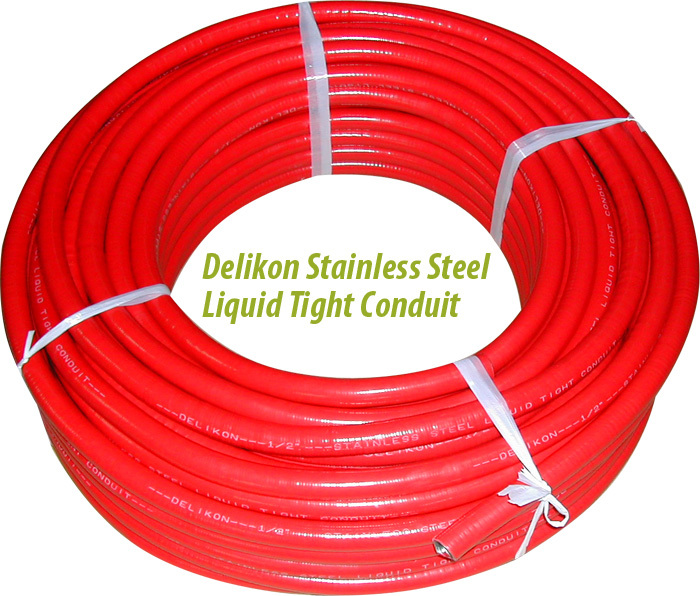 This Steel Liquid Tight Conduit is one of many top quality items from DELIKON. Flexible Metal Conduit for Heavy Mechanical Stress --- This braided flexible steel conduit is designed with an spirally wound metal armor surrounded by a steel wire braid. This design makes it suitable for use under heavy mechanical stresses. Due to the temperature resistance, braided steel conduit is also recommended for use where conduit is exposed to extreme heat. Braided steel conduit has high tensile, twisting and bending strength, while offering high flexibility. Delikon RED PVC coated Stainless Steel Liquid Tight Conduit for Fire Alarm Control Panel and fire protective signalling system wiring. For protection of cables interconnection of electrical devices within a security and fire protective signalling system and for use in dry or damp corrosive locations. Application: Used to secure EMT to box or enclosure. 1/2" thru 1" concrete-tight, 1-1/4" thru 4" concrete-tight when taped. 2" thru 4" suitable for use with steel or aluminum EMT. 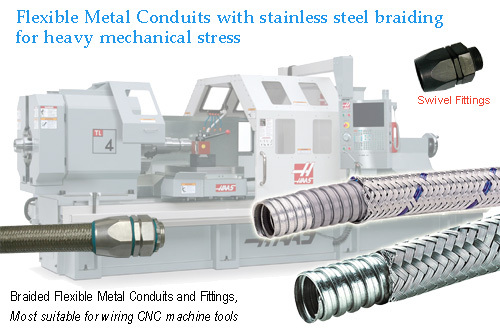 Where continuous movement, vibration, high speed and continuous cycling automated systems are concerned, braided flexible conduit has been specifically designed to deal with all the stresses relating to such applications. It has ability to work at high speed for long period offering total reliability for cable protections. The braided conduit system is available in a full range of nominal conduit sizes from 1/4 through to 4 inches. The system affords excellent mechanical characteristics, high speed capability, high pull-off strength, protection from abrasion and high fatigue life. This makes it suitable for applications such as robotics, inspection, measurement and test, automated paint and spraying plant, conveyor systems, as well as pick and place. DELIKON Racing Hose offers unsurpassed levels of performance and reliability for your tough performance applications. The Acrylnitrile butadiene rubber (NBR rubber) inner tube offers unsurpassed fluid compatibility. Full vacuum rating for sizes -10, -12 and -16. Applications include fuel, lube, coolant and air. Race cars are routinely equipped with braided hose to protect against leakage caused by abrasion and collision. NHRA rules allow no more than 12 inches of exposed rubber hose over the entire length of the fuel system. NASCAR wont allow any exposed rubber hose at all. The only acceptable alternative, then, is braided hose. Delikons high performance automotive stainless steel braided hose is here to meet your requirements! Delikon high performance hose features an inner liner of Acrylnitrile butadiene rubber (NBR rubber is well known for its oil & fuel compatibilities.). A partial coverage protective sheath of 304 stainless steel braid is embedded in the liner during manufacture. 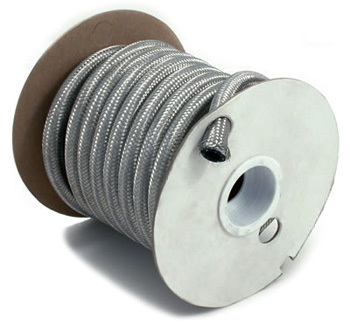 A full-coverage outer protective sheath of 304 high tensile stainless steel wire braid is then tightly woven around and bonded to the reinforced hose liner. 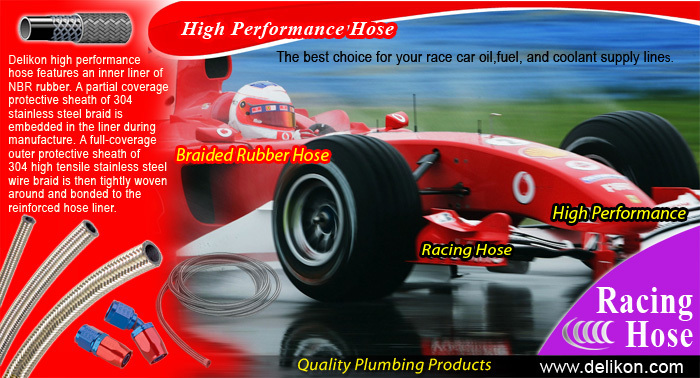 This hose is the best choice for your race car oil,fuel, and coolant supply lines. operation of the racing engine. quality of High Performance Hose. Maximum Working pressure 250 psi all sizes. This hose is used both on the street and in competition for Fuel, Oil and Water lines where pressure is NOT a consideration. 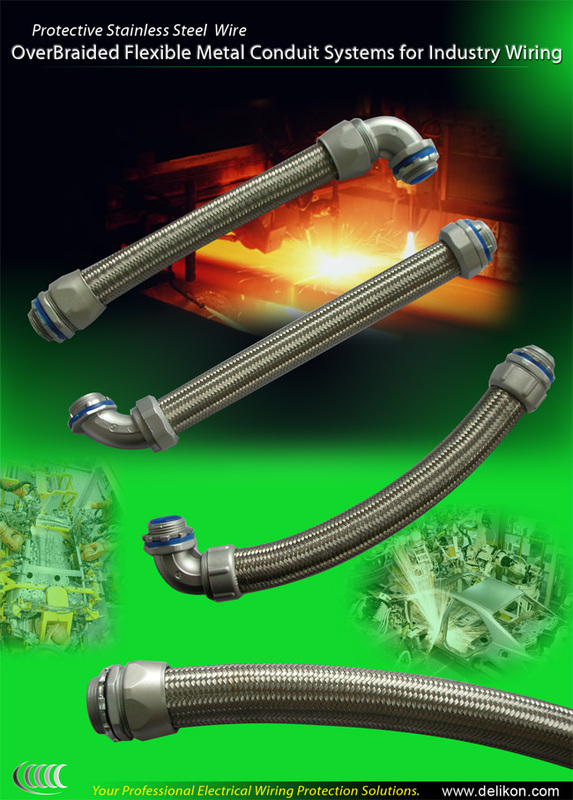 Single Stainless steel braided hose for Low Pressure Applications. It provides extra durability, and is easy to cut with a hacksaw for custom installation. This hose is used both on the street and in competition cars for Fuel, Oil and Water lines where pressure is NOT a consideration. Manufactured by Delikon to provide you with unsurpassed levels of performance and reliability for your tough performance applications. This hose is ideal for high temperature, high pressure, and offers wide range of fluid compatibility. PTFE hose is flexible and strong and when combined with stainless steel braid can perform under high pressure and continuous flexing and vibration conditions. PTFE hose can withstand temperatures from -100°F to +500°F (-73°C to + 260°C) under most operating conditions. The packaging envelopes of the modern racing car become tighter each year – leaving less room for auxiliaries such as plumbing. 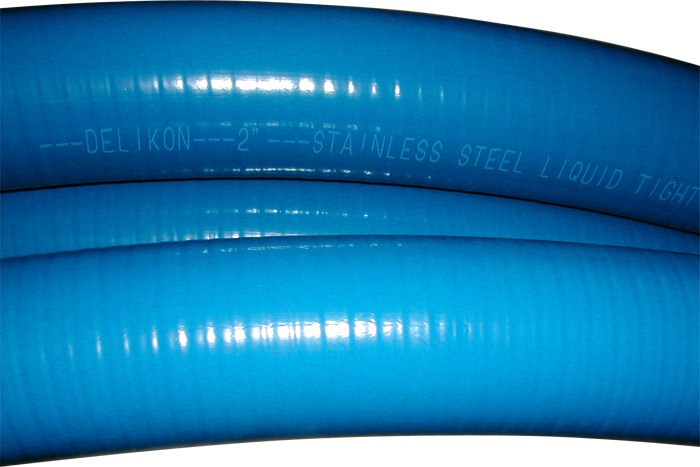 Delikons braided PTFE hose solves these issues. Delikons finest and lightest hose combines a high tensile strength stainless steel braid with a smooth bore PTFE tubing for increased flow and incredible flexibility. It also has significantly higher flow and pressure ratings than conventional PTFE hose.Applications include fuel, lube, coolant and air for automobiles or marine engines. Unlimited chemical resistance against all chemicals, acids and caustic solutions, with the exception of liquid alkali metals and fluoride compounds. Temperature resistance from -40 to +260. Weather, Ozone and UV resistance. Diffusion resistance; friction coefficient range between 0.05 and 0.20pm; flexibility; and high dielectric strength. Last but not least, PTFE hosing is suited for food\no transfer of taste or color. 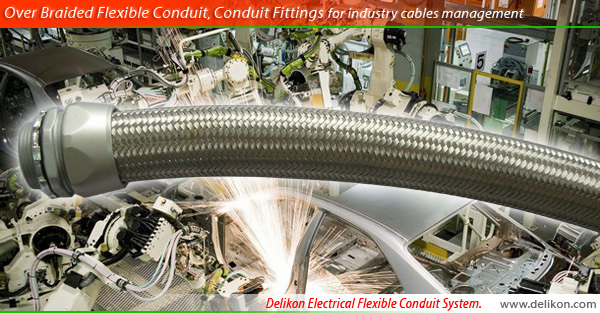 Delikon offers custom length cutting of its flexible conduits. This allows OEM customers that use the same length of conduit over and over to reduce their own labour cost by having the conduit delivered already cut into the exact lengths required. PVC Covered Stainless Steel Liquid Tight Conduit For Cables Management in very wet locationStainless Steel Liquid Tight Conduit is manufactured from an stainless steel flexible inner core which is pressure coated with an oil resistant, high temperature grade of plasticised PVC. The PVC is keyed into the corrugations of the inner steel flexible core, preventing the PVC from wrinkling when the conduit is bent to its minimum bend radius. Most suitable for use with Delikon Stainless Steel Liquid Tight Connector. Swivel external thread brass connector --- Two part fitting comprising shell and body. The external thread swivels freely about the main body. Can be used with threaded entries, or knockout secured with a locknut. Trade sizes: There are 5 available trade sizes for your applications.